2016 was the hottest year on record—and rising methane emissions are responsible for about a quarter of that increased warming. 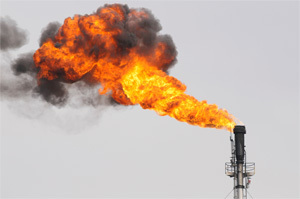 And in America, oil and gas companies are responsible for more methane pollution than any other industry. Together, we worked to put in place first-ever limits of the dangerous climate pollution that the oil & gas industry is leaking, venting, and flaring on our public and tribal lands. Now, all of that is at risk. The House has already voted to roll back these standards and block the Bureau of Land Management from issuing similar protections into law in the future without additional congressional action. That will mean more pollution and wasted taxpayer resources. Now, the fight moves on to the Senate. Take action today, and tell your Senators to protect us from this assault on public health and environmental safeguards. I'm writing today to ask you to vote against any efforts to undermine the Bureau of Land Management's limits on methane pollution. Eliminating these common sense safeguards puts the interests of the oil and gas industry above the interests of American taxpayers and their families. Nationwide, an estimated $330 million worth of natural gas from taxpayer and tribal lands is being wasted through leaks and the inefficient practice of venting and flaring every year. That's enough natural gas to supply all of the homes in a city the size of Chicago for a year. This pollution also contains methane, a harmful climate pollutant, as well as toxic and ozone-forming chemicals which increase smog and can cause cancer and respiratory diseases. There is a growing industry in the U.S. providing cost-effective services to oil and gas companies to find and fix methane gas leaks across their operations. Over 75 companies across 45 states stand ready to provide these services. It is time to put them into action, and create real job growth across the country. Please protect American taxpayers by protecting these crucial pollution limits. Our communities and families are counting on your leadership. Yes, I would like to receive email updates from Defend Our Future Action.